This is my Global Game Jam 2018 entry on the theme “transmission”. 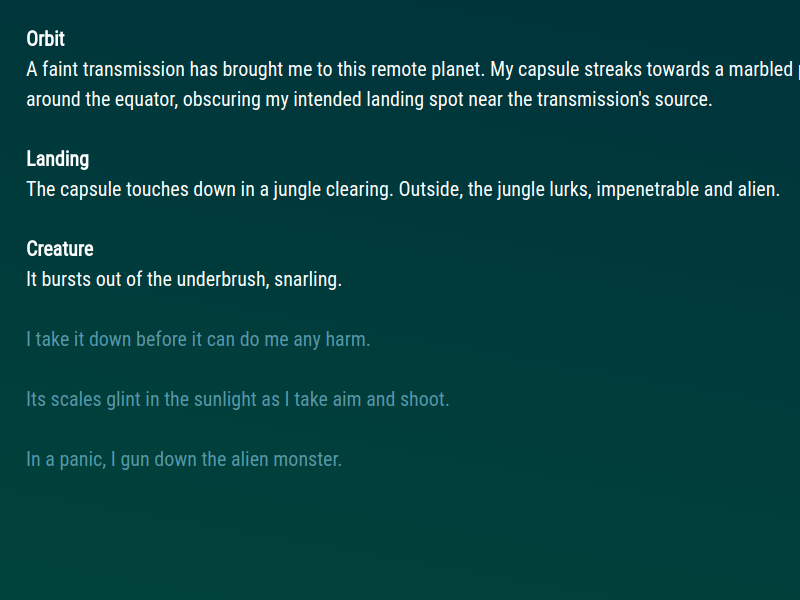 It’s a short experimental piece of interactive fiction, where I tried to do A Thing with stories. When you play a game, you tell yourself a story. You might be a conquering hero, or a reluctant one, or a rational actor. You have reasons for doing things. But the game doesn’t see these reasons, it only sees your actions. The game also tells you a story, imbuing your actions with fixed meaning. You jump on goombas to save princesses. You send space marines to their deaths to save humanity. You buy low and sell high to make cash. The problem comes when these two stories end up at odds. You try to steer a path between two extremes and the game sees this as indecisiveness. Your generally peaceful character encounters something so against their moral code that only death can balance it out, and the game cheers you on for all this fun killing you’re doing. You’ve been leading a neighboring empire into a false sense of security, but the game thinks you’re genuinely best friends. With a pen and paper roleplaying game, the game master is a human being who can work with the narratives that the players create for themselves, weaving them into the stories told by the game. For a computer game to do that, there has to be a mechanic for the player to explicitly tell it what kind of story the player is telling themselves. 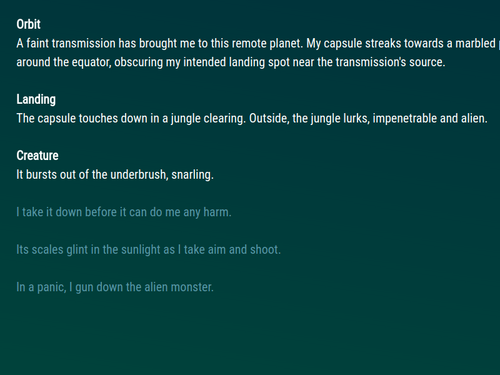 So in The Transmission, you are presented with a series of events. But unlike in a normal game, you don’t get to choose what you do. You choose how to view your actions. The same thing happens every time, but you can describe it differently. The only thing that changes is the ending, which is based on how you reacted to things. Try it out. Play it a few times.